When Apple rebranded AirTunes as AirPlay, they promised an entire third-party ecosystem of compatible devices. So far, we haven't seen many, save for a few receivers and speakers. But the JBL On Air Wireless is one of 'em. AirPlay works pretty well on the On Air Wireless. Setup is simple and straightforward. It's as reliable as the AppleTV or AirPort Express. It never cuts out, loses connection or disappears from the list of AirPlay sources in apps. There's still a dock connector if you want to plug in an iPod or iPhone, as well as aux (3.5mm jack) and FM radio sources. The sound quality of the On Air Wireless isn't anything beyond average, which is a shame. The bass lacks warmth and substance when it hits. Instead, it has a hollow punchiness. Mids and highs sound better than their low end counterpart, but are still nothing to geek out about. And then there's the design. 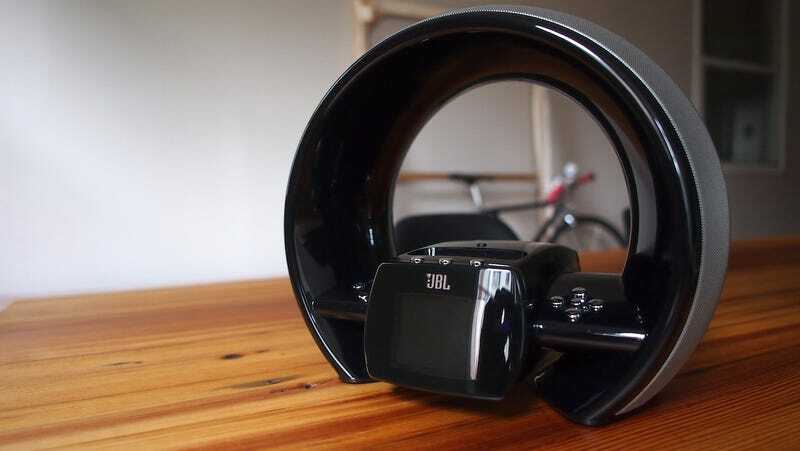 JBL says the arc design is to better project sound in all directions. However, I'd gladly take better, more pointed sound for a more minimal design. Seemingly inspired by the futurist aesthetic of a '70s sci-fi flick, the On Air Wireless is a tough object to place around the house. It's too bulky to place on a desk or kitchen counter and too distracting to place next to the TV. Given its gaudy looks, it needs a space of it's own to exist, like a bedroom nightstand or living room table. But at $350, AirPlay alone is not enough to justify that pricetag.